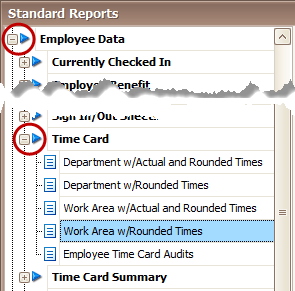 Go to Reports > Standard Reports > Employee Data > Time Card. Expand the Employee Data section and then the Time Card section. Choose a report, such as the one called Work Area w/Rounded Times. Then select a Date Range and choose Run Report. Learn how to sort, filter, print and export reports.